Increase the level of customer service in your store. 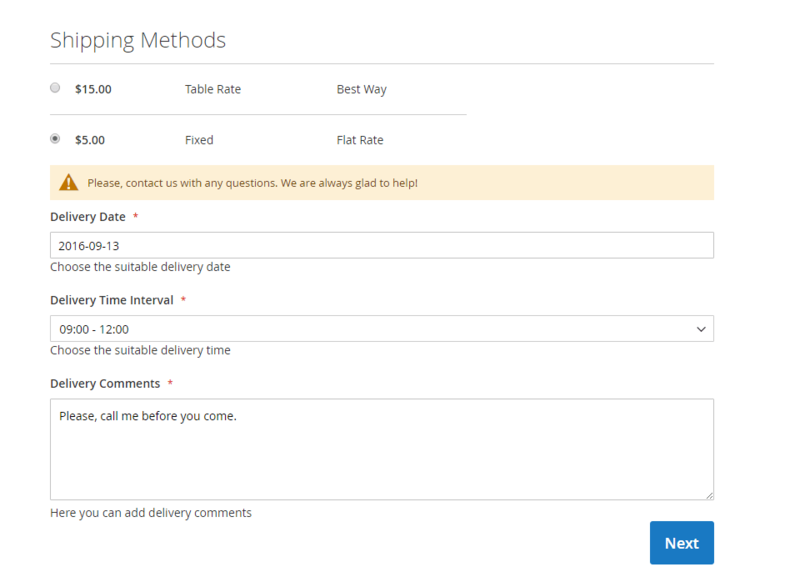 Enable clients to choose delivery dates and time periods to receive orders. Define your delivery schedule and exclude specific days or hours when delivery is unavailable. Add delivery info to emails and printed order-related docs. Nowadays e-commerce becomes highly competitive. Selling quality products is important but not enough to succeed. Clients greatly value advanced services. While standard Magento 2 delivery options suit some customers, there are many, who want the product immediately or on a specific date. This Magento 2 delivery extension is a great solution to ensure an outstanding shopping experience and streamline order management. 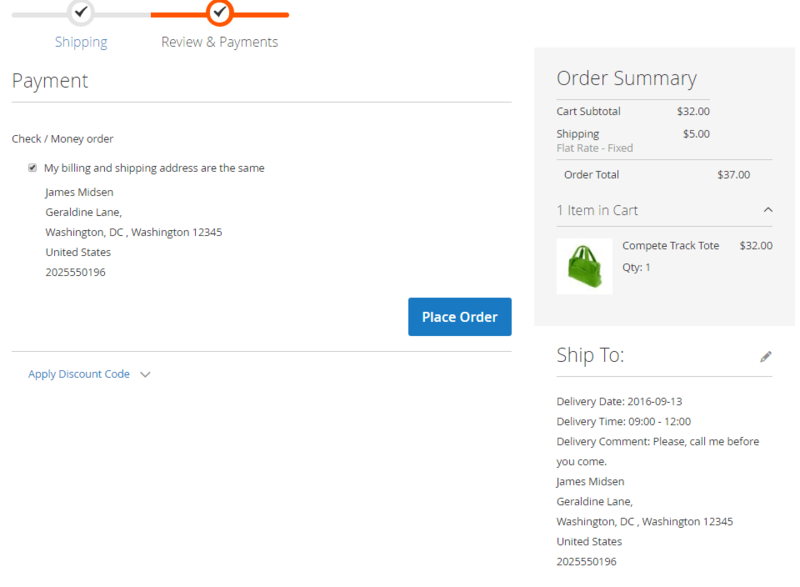 Why Magento 2 delivery time extension is a good investment? A study by MetaPack with 3,000 online shoppers, aged 18 to 65, indicated that the logistic experience is the key in the online buying process. About 49% of consumers agree to pay more for their purchases if various delivery methods are available. Offer customers the option to select desired date and time right on the checkout page. Buyers can choose the preferred delivery arrival dates and specify the most comfortable time period by fulfilling only two additional fields. They also can leave a message to a delivery person with any comments or remarks regarding the order. No extra pages or page reloads are added to the checkout process. It’s the perfect way to improve customer service effectively. Keeping customers clearly informed on available order delivery dates is very important. Sometimes Magento 2 business owners have a hard time, scheduling many deliveries in a short period of time on weekends or holidays. Our Magento 2 delivery date extension allows you to block all unavailable delivery dates on the calendar and instantly update clients on your current schedule. This feature of the delivery date module also helps to avoid a common mistake of selecting a day that has already passed. On Magento 2 backend you can define the most convenient time intervals between the actual order and delivery date and time. You can choose minimum and maximum delivery intervals according to your needs. Minimal delivery time can include an extra day or two depending on the estimated shipping date. So if a product would be shipped approximately in two days, you can set min. delivery time to 3 days to be absolutely sure that a customer gets a product on time. It’s also possible to indicate by which time an order should be placed if a customer wants to receive an item on the same day. Set an interval offset for the same day of delivery that will be equal the time between current time and the first delivery time that can be selected by a customer. Everyone experienced a whole day of waiting when the purchase for the purchase to arrive at your door. Save shoppers from that irritating feeling by offering a range of time intervals for the delivery. You can set delivery time intervals both manually and automatically; they also can vary for different Magento 2 store views. It is typical when customers need to change the delivery date after their orders have been placed, but before they have shipped. The extension offers the rules and conditions to allow clients the editing of the scheduled delivery. The rules are based on date and order status: set the lockdown period and status of the order, which will enable the editing. Your web store has products of different size, weight, stock location, etc. For some of them, it takes more time to be delivered. The feature allows you to set a minimal delivery interval for such products individually. Independently of general settings. Inform customers about the upcoming delivery; you just need to specify particular time (in hours) before the purchase arrives and select an email template for the occasion. If you have Sales Reps and Dealers extension for Magento 2, this reminder can be sent to the dealer as well. This tool is based on the leading edge technologies and offers a wide variety of options and settings for admin users. It can be easily configured to suit your business needs. The extension was well thought out and we were able to use it for shipping date function with simple modification to translate file. 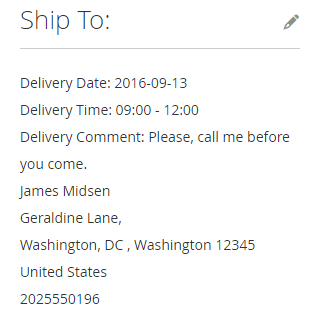 When we needed to pull this into xml feed for fulfillment software, support was able to help pull delivery date info into xml feed. It may save heaps of time for you and your customers. A nice module, and really helpful support. I highly recommend this extension. – Fix: issue related to delivery comment length was fixed (database schema updated). 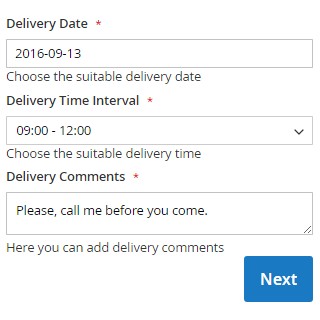 – New: introduced new validation for the Delivery Time option. Now time intervals for the time that has already passed won't be displayed on the frontend. – Fixed: Incorrect Date Interval work when "From Year = Each Year"
– New feature: Minimal Delivery Interval by Product. Now it's possible to set specific Minimal delivery interval (which override general rule) for desired scope of products.